The consumer goods giant is readying the U.S. launch on Jan. 21 of its latest brand, Skinsei — a direct-to-consumer, wellness-inspired skin-care line with a personalization bent — that was developed in-house by a team of five working across Unilever's London and Englewood Cliffs, N.J., headquarters. Skinsei is the latest example in a series of Unilever original productions to launch in the U.S. market. A mass-market hair-care brand, The Good Stuff, made its debut earlier in January. The Right to Shower, a body-care line with a socially conscious spin, is set to roll out Feb. 1, and the incubated brands Unilever introduced late last year — Love Beauty and Planet and ApotheCare Essentials — launched significant category extensions in early 2019. ApotheCare, which launched as a hair and body-care brand, is pivoting to focus on facial skin care, and Love Beauty and Planet has branched outside the beauty space with a home care extension, Love Home and Planet, due out in March. With market valuations for beauty brands at a premium, building one can also be a way to fill a white space in a group’s portfolio without shelling out hundreds of millions of dollars for an acquisition. Incubation is also a way for big beauty behemoths with traditional corporate cultures to experiment with the start-up style structures Millennial employees have become accustomed to. Incubation was a big buzzword last year, as major players in the beauty and personal-care space — particularly in the mass market, which has struggled in the U.S. due to consumers opting to shop specialty and e-commerce over drugstore aisles — raced to deliver brands with Millennial-friendly offerings and distribution. While Unilever launched ApotheCare and Love Beauty and Planet in late 2017, L'Oréal introduced David Beckham-backed men's grooming line House 99 in February 2018 and in April, eco-friendly Seed Phytonutrients. Johnson & Johnson in August launched a Gen Z-oriented Clean & Clear offshoot, C&C, exclusive to Ulta Beauty. With its flurry of new brand announcements this year, Unilever has emerged as the most active personal-care company in the incubation space, particularly in the U.S. market, where a culturally and ethnically diverse consumer set magnifies the need for hyper-targeted beauty brands. The in-house development of portfolio additions is likely to continue, partly because of new chief executive officer Alan Jope's knack for brand-building, company execs told WWD. "It is all in the context of creating brands that appeal to the increasing variety of ," said Esi Eggleston Bracey, executive vice president and chief operating officer, North America, of the overarching strategy driving Unilever's new brand incubation. "People are asking for more personalized and individualized solutions. There's no more one-size-fits-all — you can't put people in a box, want things that speak to them." Incubation can happen "wherever there is a consumer need" to be addressed, said Bracey. Sometimes, the company addresses a consumer need in multiple ways. "It's not always an 'either-or,'" said Bracey. "There are a number of opportunities we're addressing through incubation, acquisition and on our core brands." She pointed to the growing consumer demand for natural deodorant formulas. Early last year, Unilever completed its acquisition of Schmidt's, a fast-growing deodorant brand. This year, Unilever is launching Dove Zero, the brand's first aluminum-free deodorant formula. Another example is this year's The Good Stuff, a no-rinse conditioner brand that offers several conditioner formulas targeted to specific hair types. Dove and TRESemmé, both key hair-care brands in Unilever's core portfolio, are releasing specialized conditioner formulas in the first quarter. The company's commitments to social and environmental responsibility are driving the way it thinks about new brands and products, whether it is incubating, acquiring them, or adding product extensions to its core lines, said Bracey. The Unilever Sustainable Living Plan introduced in 2010, lays out a roadmap to reduce its environmental footprint and increase its social impact by 2020. To that end, many of its new brands have an element of sustainability and social consciousness to them. "We want to be the beauty company that makes the most impact — that’s impact on people, communities and the planet at large," said Bracey. "That starts with the recognition that people are shifting, they're becoming more diverse." Unilever's latest incubated brand, Skinsei, addresses just that — its social media tagline, "#noskinlikeyours," references the line's personalization factor. Launching on skinsei.com on Jan. 21, the Skinsei customer experience begins with a quiz containing questions about consumer lifestyle habits, including diet, pollution and sun exposure, amount of sleep and levels of exercise and stress. 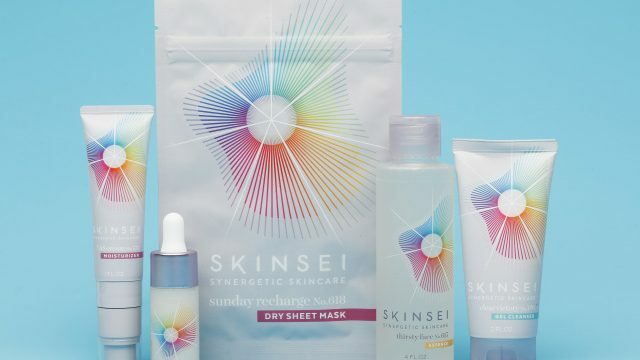 The quiz culminates in a personalized regimen of Skinsei products — there are one million possible combinations that can be made from Skinsei's assortment of several dozen items. Products must be purchased as a set, and are available at subscription or regular pricing. Subscriptions are priced at $45 for three products or $69 for five items. Onetime purchases are $49 and $79. The idea for Skinsei came from Valentina Ciobanu, global brand vice president of new skin-care brands at Unilever, at a time in the company where there were very few examples of new brand incubation. Two years ago, Ciobanu, who now uses Skinsei founder in her title, was working in a global strategy role, reporting directly to Jope. The two were stuck in traffic on a business trip to Manila and the conversation turned to wellness trends. Ciobanu told Jope about an idea she'd had for a skin-care brand tailored to individual lifestyles and wellness habits. Jope told Ciobanu to put together a formal proposal and go for it. "I started this project because I felt the skin-care industry took a view that was too narrow of what needs, ignoring these links between our skin and wellness, lifestyle and environment," said Ciobanu. "My best friend and I are the same age, but we live in different climates and and our skin is not the same." Skinsei is launching first in the U.S. where the personalization and customization trends in beauty are beginning to take off, and will use paid social and mirco-influencers to spread the word to consumers. Ciobanu told WWD it is too early to tell if the brand will become a global one, and will base its decision to expand to other markets based on customer feedback. For a brand incubated within a corporation counting upward of 160,000 employees, working on Skinsei has been an opportunity to operate start-up style, said Samantha Mang, senior brands manager, new skin-care brands at Unilever, who works out of the U.S. office and reports to Bracey. "I've never been closer to a brand or consumers," said Mang. "When were doing the beta test, I was literally doing customer service, getting feedback and answering messages . When I realized we needed to get testimonials, we worked with girls who I'd DM-ed with." That sentiment was echoed by Piyush Jain, vice president of hair care for Unilever North America, who oversees Love Beauty and Planet, The Good Stuff and ApotheCare Essentials. Based on consumer feedback, Jain's team launched body lotion and deodorant under the Love Beauty and Planet brand just six months after its launch last year — a significantly shorter time frame than on a core Unilever brand. "Our ability to understand what consumers want is much quicker," said Jain. "Within six months, consumers were asking us, 'Do you have lotion? Do you have deodorant?' That inspires us to go faster." Launching in March is Love Home and Planet, the home-care extension of Love Beauty and Planet. Consisting of 38 sku's, including laundry detergent, dishwashing soap, dryer sheets and multipurpose cleaning spray, Love Home and Planet products are formulated with ethically sourced, plant-based extracts and packaged with majority recycled and recyclable materials. Prices range from $3.49 to $12.99. A limited amount of products are available now on target.com. The line will roll out to mass retail in March. "We're seeing the definition of beauty and self- expand," said Sonika Malhotra, global brand director of Love Beauty and Planet Innovations, of the decision to expand into home care. "What started with, 'This is what I'm putting on my skin and face and body,' is now expanding into home. We realized this brand category-specific, it can be a lifestyle brand." That kind of flexibility is indicative of how Unilever is approaching incubation. "Where don't I see opportunity?" said Bracey. "We've got a range of categories and there's not one where we're not incubating. If there's a need and opportunity in beauty and personal care, we'll address it." Jope's appointment in November to his role of ceo could herald more brand incubation and newness at Unilever. The company's former head of beauty and personal care is known for the rapid-fire series of beauty acquisitions he oversaw while running the category beginning in 2014, including Dermalogica, Dollar Shave Club and Sundial Brands. "Alan is a brand-builder at his heart," said Bracey. "He was recruited into marketing so he has a love for people, brands, innovation and novelty and he's been all over the world. I'm sure we'll see even more of that come through." Next Post:Increased health risk: Therefore, in accordance with the bananas-consumption of the hands, be sure to have washing!